On January 6, 2004, the Macintosh was a few days over 20 years old and Steve Jobs had exciting news: Apple had a new type of software, called GarageBand, and a new format for the iPod, an iPod Mini with a huge 4GB of storage. How would we ever fill all that space? With this month’s release of the newest version of GarageBand, it seems like a great time to remember its introduction, with John Mayer performing and Steve Jobs explaining the ways that it would open a world of possibilities. Interested in seeing the whole Macworld 2004 Keynote? Interested in stats and information for every Apple Keynote, from 1997 through 2016? Read more below. The number of Apple User Groups worldwide is amazing, especially considering that many groups have been in existence for decades. Still, as new groups form, some groups cease to exist, often because key members retire or membership numbers drop. This article offers the the quick and simple, step-by-step process for delisting a group with the User Group Locator and the User Group Program. Need a presentation for your group’s next meeting? Ask your group’s ambassador about Apple Sales Web (ASW). From prepackaged demos to Apple materials that you can use to create customized presentations, ASW has it all. Interested in the new Apple AirPods? Be sure to check out ASW’s AirPods – First Look posted on December 13 (L547674A-en_US). Curious about the new TV app and tvOS check out tvOS – First Look and TV app – First Look (L546871A-en_US and L549055A-en_US), both published on December 12. Ambassadors: December is a great month to check out ASW! 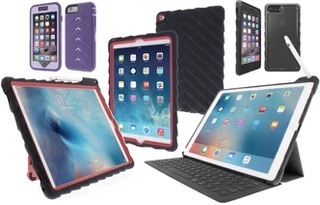 Gumdrop Cases provides stylish, heavy-duty, and incredibly protective ruggedized cases for iPads, MacBooks, iPhones, and more. Designed with durable protection that can withstand repeated 6-foot falls, Gumdrop’s cases are rapidly becoming one of the leading solutions to keep your tech safe from damage at home, school, and work. With over 1,600 certified case reviews from satisfied users, Gumdrop cases has a selection of cases types to fit your device, from DropTech type cases, to Hideaway, Sleeve Series, SoftShell, and more. Annual Records Update: Is Your Group Ready? Are your group’s Apple User Group Locator records up to date? This winter the Locator team will be updating the database. Groups who have not updated their records since 2015, and groups with dead web links or non-functioning email addresses will be put on pending. The team is also checking web sites: has your web site been updated since 2015? Make sure your group stays on active status. Update your group’s records today. September 17 marks the 13th annual Software Freedom Day celebration, with over 300 planned events worldwide. The day calls attention to software that is free to distribute, modify, access, share, study and use. As part of the celebrations of Software Freedom Day 2016, AppleUsers.org has compiled a selection of some of the best, yet totally free, software that’s available for the Mac, collected together on a single DVD, called Spotlight on FOSS 2016 plus a bonus video and a copy of The AppleUsers Spotlight Software Freedom Day 2016 Special Edition. Fans of Stephen Fry will especially enjoy his Happy Birthday to GNU video. Thanks as always to Mr. Pyers for these wonderful resources! See below for more information. Groups are always looking for a great presentation and this month Nicholas Pyers of AppleUsers.org offers valuable insights into ways to find guest presenters. His recent article, the fifth installment in his “Working with Presenters” series can help you reconceptualize the process and increase your ability to organize great meetings. Want to know more? Check out all five articles in the series. Thanks as always to Mr. Pyers for these wonderful resources!